This is a mahogany Empire style chest of drawers with a cherry top and original glass pulls. As an antique Empire style chest, this piece dates back to 1875  1890. The finish on the cabinet and drawers is original and is in good condition. 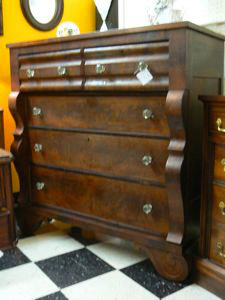 The finish on the top of the chest has been restored and is in excellent condition. The veneer on the drawer fronts shows some wear as is typical of furniture from this time period. Additional photos are available upon request. Local delivery is available. Shipping and handling charges apply and vary with the destination, or you can make your own shipping arrangements. Please call for a quote.